Recycling Works: Is Yard Waste Recyclable? Green stuff (high in nitrogen) This activates the heat process in your compost. Perfect heat-generating materials include young weeds, chicken, grass clippings, fruit and vegetable scraps, coffee grounds and tea leaves (including tea bags), vegetable plant remains. Brown stuff (high in carbon) to serve as the "fiber" for your compost. Brown stuff includes autumn leaves, dead plants and weeds, sawdust, straw, old flowers, dried flowers, and hay. Other items that can be composted that you may not have thought of before include paper towels, paper bags, torn up cotton clothing, and eggshells. Air. It is possible to compost without air (anaerobically), but the process generates different bacteria and an anaerobic compost pile will take on a sour, vinegar-like smell. It may also attract flies or take on a matted, slimy appearance. 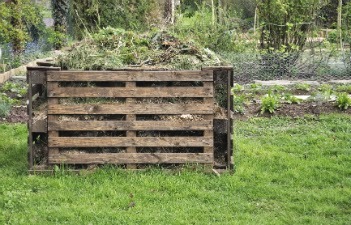 If your compost pile needs more air, turn it and try adding more dry or brown stuff to open up the structure. Water. Your compost heap should be about as damp as a sponge that has been wrung out. Depending on your climate, you can add water directly or rely on the moisture that comes in with "green" items. A lid on the compost bin will help to keep moisture in. If a pile gets too much water in it, it might not get enough air. Temperature. The temperature of the compost pile is very important and is an indication of the microbial activity of the decomposition process. If the temperature is too low, you should add more materials that are high in nitrogen to the bin. Soil or starter compost. This is not necessary, but a light sprinkling of garden soil or recently finished compost between layers can help to introduce the correct bacteria to start the compost cycle a little more quickly. If you are pulling weeds, the soil left on the roots may be sufficient to serve this purpose. Compost starters are also available.